When you use your vehicle to haul heavy cargo or tow your camper, boat, or work trailer, your factory leaf springs come under load and flatten out. Driving with your suspension in this position causes your truck to easily sway or wobble, making control difficult. Adding SuperSprings suspension stabilizers will eliminate this condition and put you back in control! As you add load to your rear suspension, these helper springs will be activated through the rollers on each end. This keeps your leaves from flexing as much and prevents excess sway, giving you better control when towing or hauling big loads. SuperSprings simple design "deactivates" automatically when your not hauling or towing since they only come into play as you add tension to your rear suspension. 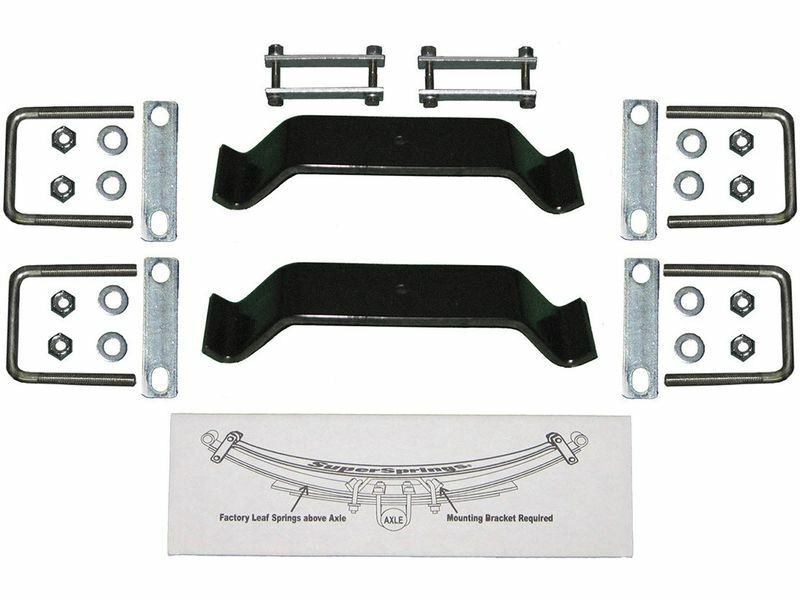 SuperSprings come in several different lengths to fit a variety of different sized leaf springs. They are also made in light, medium, and heavy duty strengths to fit your specific needs. All components are powder coated to protect against corrosion and extend their lifespan. Installation is super simple since there are only a few bolts to tighten on most vehicles and no special tools required. Detailed instructions are included specific to your particular vehicle. You should have no problem getting your new helper springs added in about an hour. Get your self better control and enhance the load carrying capacity, handling and towing of your truck with SuperSprings suspension stabilizers. You can be proud to know they are made in America and come backed by a five year warranty. Go ahead and get yours today! Even though SuperSprings will enhance your load capacity, never load your vehicle beyond the manufacturer's gross vehicle weight rating. Two (2) years when used in commercial applications. This limited warranty extends only to the initial retail or fleet purchaser with respect to use upon the vehicle the product is first installed. The term shall be measured from the date of purchase. SuperSpringsâ¢ reserves the rights to: (a.) require claimantâs proof of purchase as a condition of this limited warranty, (b.) make future revisions to its limited warranty without prior notice. As used herein, âcommercial applicationsâ means any vehicle intended, licensed or used (partially or otherwise) in connection with commerce and shall include but not be limited to âCommercial Motor Vehiclesâ as defined or intended by the U.S. Code of Federal Regulations. - Normal wear and tear, deterioration of spring shape or rating, alteration or failure to maintain. Scratches or defects in product finishes (powder coating, paint, etc.) or damage due to shipping. - Misuse, including products used other than as recommended in the current SuperSpringsâ¢ application guide or the instructions. This limited warranty gives you specific rights. You may also have other rights that vary from state to state. Some states do not allow limitations of how long an implied warranty lasts and /or do not allow the exclusion or limitation of incidental or consequential damages, so the limitations and exclusions herein may not apply to you. Installing your SuperSprings suspension stabilizers doesn't require any special training, although an understanding of basic auto maintenance & repair is helpful. Most of these helper springs can be installed in about 30 minutes to 1 hour. Step-by-step instructions ensure you can correctly complete the install safely. if you have any questions or would like additional information regarding this or any other SuperSprings product, simply give one of our customer service representatives a call any day of the week.